Florida State quarterback Deandre Francois is happy to be playing football again and is trying to get his job back. He’s back on the practice field after injuring his knee in a season-opening loss to Alabama last fall and sitting out the rest of the year. New Florida State coach Willie Taggart has said he hasn’t set a timetable on naming a starter for the Sept. 3 opener against Virginia Tech. The coach is also looking at James Blackman , who filled in for an injured Francois last season, and redshirt freshman Bailey Hockman. 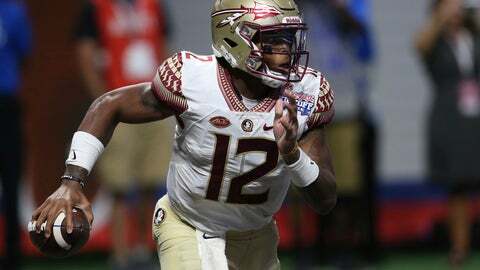 Francois wants to build on what he accomplished in 2016, when he threw for 3,350 yards and 20 touchdowns while helping the Seminoles earn an Orange Bowl victory . He’s one of several notable players coming back from injury. A list of players returning this year compiled by The Associated Press only includes players who missed at least half the season with season-ending injuries. That disqualifies Washington offensive tackle Trey Adams and Michigan quarterback Shea Patterson, who played just over half the season last year. They both could have a major impact on their teams. Since Middle Tennessee quarterback Brent Stockstill and Alabama linebacker Christian Miller returned from injuries late last season, they are also not listed. OT Chance Hall, WR Jauan Jennings, S Todd Kelly Jr. and LB Darrin Kirkland Jr. Injuries to key players played a major role in Tennessee’s fall from the Top 25 to the SEC East cellar last season. Hall, Jennings, Kelly and Kirkland have 62 career starts between them, but they played a combined total of three games last season. Hall and Kirkland didn’t play a single down due to knee injuries. Kelly, Tennessee’s leading tackler in 2016, played just two games before a knee injury shut him down. Jennings, the Vols’ second-leading receiver in 2016, injured his wrist in the 2017 opener. They’re all practicing now. Reid earned honorable mention all-Big Ten honors in 2016 but sat out the 2017 season after injuring his left knee in spring practice. The 5-foot-10 Reid is back now and will try to boost a defense that must replace nine of its starters from last year. During the 2016 season, Reid started all 14 games in the secondary and also returned punts. He scored six touchdowns in South Carolina’s first three games last season before a broken leg knocked him out for the remainder of the season. Now he’s back as a fifth-year senior. Samuel’s six touchdowns last year came on three receptions, one run from scrimmage and two kick returns. He shared team MVP honors with quarterback Jake Bentley in 2016. Thompson caught 64 passes for 1,269 yards and 11 touchdowns in 2016, and he was on pace for another 1,000-yard season last year until he got hurt. He collected 28 receptions for 537 yards and four touchdowns in five games before a leg injury shut him down for the remainder of the season. The fifth-year senior has career totals of 133 catches for 2,665 yards and 20 touchdowns. Wilson had 38 caches for 490 yards in only five games last season before a foot injury shut him down for the rest of the year. He already has shown an ability to produce big numbers against high-profile opponents. Wilson had 15 receptions for 208 yards when UCLA came from behind to beat Texas A&M in the season opener. He caught 11 passes for 145 yards against Stanford. He headed into last season as a defensive team captain, but Wilson broke his foot in the opening loss to UCLA and didn’t play again. He’s back as a fifth-year senior this fall and should play a big role in Texas A&M’s secondary. He picked off five passes in 2015 and made 59 tackles in 2016.